Traditional tin toys have been cherished by past generations, and now your child can cherish them too. 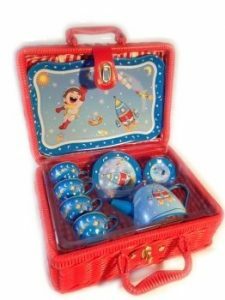 In our collection, discover a plethora of fun tin toys, from pretty tin tea sets, to charming tin Jack-in-the-box toys. At Baby Vegas, you can find high quality tin toys, from some of the best children’s brands in the world, including Cocomotion, iS Gift, Jasnor Australia, Knox and Floyd, Koala Dreams, Old Street Trading, Schylling and the Purple Cow. Cute and fun, yet sturdy and robust, tin toys are sure to stand the test of time.